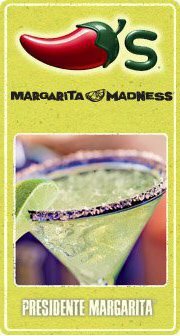 Chili’s: Three days of $35 MargarEATathon – only $35 for an Appetizer, Two Entrees, Dessert and Two Top Shelf Margaritas. For the next three days, 6/27, 6/28 and 6/29, Chili’s is celebrating with a $35 MargarEATathon. For $35, you get an Appetizer, Two Entrees, Dessert and Two Top Shelf Margaritas. “Like Chili’s on Facebook then go HERE to print your coupon.